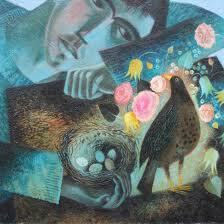 Heaney’s St Kevin and the Blackbird begins with a saint kneeling – arms outstretched in his narrow cell. One of his upturned palms is out the window. This invites blackbird to lay in it and settle down to nest. St Kevin feels the warm eggs and small breast of the bird and finds himself linked with the network of eternal life. He is moved to pity because now he must remain in this position until the blackbird’s young have grown up and flown away. This leads to an intense self-scrutiny where he questions whether he’s even imagined being himself at all. He examines each part of his aching body and then slowly slips out of himself into the solitude of prayer. This poem is about the tension of man as a part of the material world (nature) and his more divine self that is shared only with God. It elaborates on the pain of incarnation and the man’s innate yearning to be at one with the divine. In the end, it may even suggest a religious or mystical experience through which one senses one has connected with God. The use of free verse contributes to the overall sense of the search for order and place. That each stanza consists of three lines reinforces the notion that such order is to be found in the Trinity – traditionally the three faces of the divine. The use of the specific name of St Kevin (as opposed to an anonymous seeker) gives an overall sense of reassurance. We know whom we’re dealing so in the end everything will turn out fine. The first line in the first stanza (where Kevin and the blackbird are introduced) is end-stopped. This shapes the initial feeling that nature (of which man is a part) is all that there is. However the next two lines– are run-on-lines giving the impression of expansion beyond that which man incarnate is able to physically touch. The cell is ‘narrow’ (the word cell is repeated to emphasize the sense that incarnation is a prison) yet St Kevin does his best to escape. Because he’s kneeling, we know he means to accomplish this through supplication. Thus man’s horizons broaden when he appeals to that within him, which is divine. One thing leads to another as the run-on-line into the 2nd stanza suggests. St Kevin has only partially managed to set himself free. Only one ‘turned-up’ palm is ‘out the window’. The words ‘stiff’ and ‘crossbeam’ reinforce the feeling of man’s frustration to be in his body – separate from God. However when the blackbird (birds are symbolic of messengers from heaven) ‘lands’ on his palm there’s some suggestion that through nature man can find his desired communion with God. The messenger from heaven (the blackbird) finding himself comfortable in the ‘’palm’ of a man (usually we find man in the hands of God rather than the other way around), ‘lays’ and ‘settles’ to ‘nest’. This is the beginning of something that will grow with time. The end-stopped line at the end of this stanza also suggests that St Kevin’s yearning has found temporary rest. All is in order when man and the heavens are at one. The next stanza stirs things up again with the use of run-on-lines. There’s an uncomfortable contrast struck between the feeling of ‘warm eggs’ and ‘claws’. Now Kevin (a regular person like you and me no longer referred to as St) is ‘linked’ with the ‘network’ of ‘eternal life’. This suggests that by his experience he’s fallen in status. While the experience feels ‘warm’, it’s also unpleasant. In a run-on-line into the next stanza we find indeed the experience in uncomfortable enough to have moved him to ‘pity’. This a strange word to choose. The cause of the ‘pity’ is that now Kevin must ‘hold his hand’ ‘like a branch’ until the baby birds have grown and flown away. I would have thought Kevin would feel ‘anger’ instead of ‘pity’. That he doesn’t suggests he’s already overcome some of the emotions of man and transformed them into something more (Christian-based) divine. A end-stopped line finishing the stanza give a sense of finality. At this point we get a sense that everything is so static that something must give soon. After the break, come the questions. The tone has clearly changed. A transition of some kind is in process. Like Kevin, we struggle to make sense of where we are and where we’re headed next. There’s very little punctuation from now through the end of the poem except for the question marks. This adds to the feeling of searching and being lost. Despite the lack of end-stopped lines, the sense and grammatical structure of the lines don’t really run over. It’s abrupt. Not continuous. So how and where will we find our place? Perhaps we won’t. Perhaps everything is shutting down? Kevin ‘imagines’ ‘being’ Kevin. He ‘forgets’. His fingers are ‘sleeping’. He feels his body (his ‘hurting forearms’) yet he has thoughts of stillness (even perhaps death) – ‘shut-eyed’, ‘blank’ and ‘underearth’. Equally however he could be moving into a trance that is often the precursor to a mystical or religious experience. This is suggested by the words ‘distance in his head’ which could point to an out-of-body experience. He is definitely ‘praying’ while at the same time slipping away – his body ‘entirely making the prayer (as opposed to his mind). Also there ‘forgotten’ is repeated 3 times – suggesting that he is deep in meditation (or the religious or mystical experience) and thus has stepped away from ‘self’. The sense of slipping away is further reinforced by ‘love’s deep river’, which is winding further and further away. The poem concludes with Kevin having completed the journey he commenced at the beginning. At least in one sense, he’s no longer man incarnate and separate from God. In many ways this is a soothing poem. Although the use of free verse and many run-on-lines suggest displacement and ‘agony’, the use of the 3-line stanza structure reassures us that order is in the end, preserved. Thus the poem itself creates a safe space for Kevin to let go of ‘self’ and join with God. This is skilfully accomplished through using of a heavenly messenger (a bird) coming down to Kevin while at the same time Kevin moves up to God. The circuit is complete. I really admire this, this goes well with what we are studying with Robin Bates-BetterLivingThroughBeoWulf, on Despair and Depression. Thanks for reading my blog post and glad you enjoyed it – sorry it was wordy – preparing for an exam on 13 June – have a ways to go to perfect my approach! Wonderful! This makes so much sense! Thank you very much – I hope the exam went well.